No pet owner wants to see their furry family member suffer from muscle and joint pain. Have you noticed your pet slowing down, having trouble with everyday movement? As your dog ages the probability of arthritic pain increases greatly: at ages 8-10 years 27% of dogs suffer from arthritis. The numbers increase to 37% for dogs 11-13 years old. If you've seen signs your dog is slowing down, this may be due to joint and muscle pain common in arthritis. It is difficult to diagnose arthritic pain in cats due to their stoic nature. If you've noticed your feline friend slowing down, having problems reaching the litter box, or isolating themselves from the family, pain may be the cause. The doctors and staff of Warwick Animal Hospital hate to see your pet suffer from joint and muscle pain. We've invested in the latest laser therapy to provide an alternative solution to pain management. Ask our doctors and staff how K Laser Therapy may provide a solution to your pet's muscle and joint pain. We are proud to introduce K Laser Class IV laser therapy for your pets. Its beneficial uses include alleviating chronic pain, accelerating healing & rehabilitation and much, much more! Class IV means far more power than was previously available for laser therapy. Photobiomodulation is the scientific term for K Laser's effect on the tissue. Deep-penetrating photons from the laser influence cell chemistry in a variety of beneficial ways. In addition, the infrared wavelengths create a warm sensation in your pet's body at the precise location requiring treatment. Treatment time, power and laser pulse frequency are based on your pet's individual condition and body size. After surgery, patients receiving laser therapy have less pain. Their recovery is faster, with fewer complications. Pet owners often prefer a progressive, noninvasive therapy to a drug regimen for the treatment of chronic pain. K Laser therapy provides that solution. Laser therapy can significantly reduce healing time. Traumatic skin injuries and surgical incisions benefit greatly from laser intervention. Musculoskeletal injuries and orthopedic surgeries often require additional rehabilitation solutions. 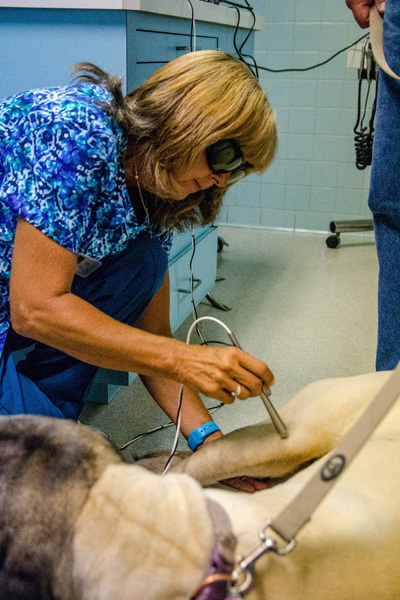 Laser therapy provides non-invasive remedies for quicker recovery. Class IV laser therapy has been very successful in the field of human medicine. We are pleased and excited to be able to offer it for the treatment of our best friends! There is no patient sedation or anesthesia required -- the experience is usually pleasant and comforting to them. This avoids the risks and expense of anesthesia and sedation. Most pets do not need to have their hair clipped. Although improvement is often seen after the first visit, most patients require several treatments [3 to 8] for greatest benefit. For most conditions, we recommend a multi-visit treatment plan. Treatments vary in length, but most sites require 2 to 8 minutes. A majority of patients exhibit greater comfort and mobility within 12 to 24 hours after a laser treatment. Your veterinarian will recommend a treatment plan specific to your pet's condition. Read more about K Laser therapy in our brochure or visit the manufacturer's website.